Get green card fast on H1B if my kid is born US citizen? Can US born citizen kid sponsor their parent working on H1B? Yes, kid can sponsor his/her parent working on H1B visa in USA for a Green card, but only if he/she is 21 or older. Even if the kid reaches age 21 and sponsors parents, he/she has to show the sufficient money/income source, pay income taxes to support parents and apply on his own and fill the affidavit of support. Can H1B visa working parent’s Green card be expedited by US born child? The sponsorship by Adult kid is counted under family immigration (limited yearly Green cards) for non-immediate relatives. A parent on H1B visa with a US born kid is an immediate relative including any unmarried sister or brother under the age of 21 and eligible to get US green card immediately (no yearly limits and no waiting Queue). A green card is ALWAYS available for a US citizen, which is your kid. This can prove to be a blessing in disguise for an Indian EB2 H1B worker, who can get the sponsorship from US born child citizen and ditch the extremely long H1B visa’s waiting queues. Can Parent on H1B stay in US without visa if US citizen kid sponsors? In H1B case, it is recommended for the parent to maintain the H1B status, till the time child turns 21. H1B visa status need an employer and continuous employment to stay and work in USA. 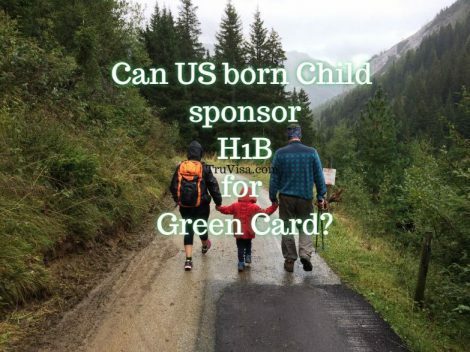 Get Green card fast on H1B if US born citizen child sponsors? When the kid turns 21, he can sponsor the parents as an immediate relatives. H1B worker will not be able to stay in US beyond 6 year limit, on H1B unless, they have their green card under-processing and have i140 approved.